Ephemeral map showing an incomplete understanding of the American Arctic. A Map of the Countries Thirty Degress Round the North Pole. 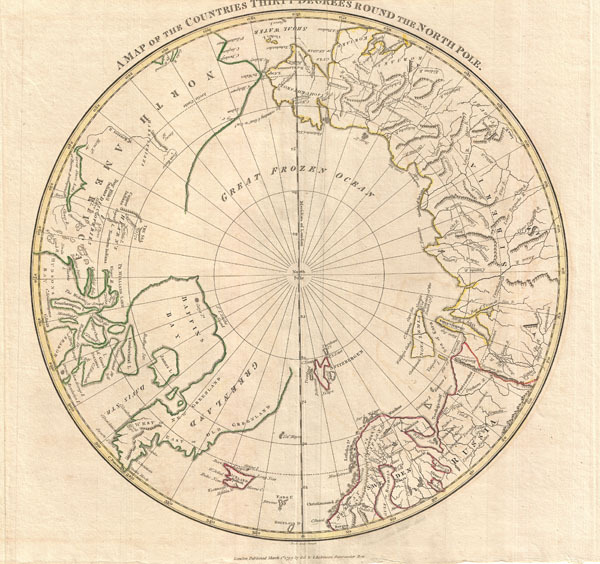 A fine 1799 map of the northern polar regions by the English map publisher Clement Cruttwell. Covers the polar regions from roughly 60 degrees north latitude to the North Pole. Reveals a primitive yet ephemeral understanding of Arctic geography. Evidence of the exploratory work of Tschirikow and Vitus Bering is clear in the northeast parts of Asia and Siberia. However, the geography of North America across the Bering Straight is less clear with no significant inland detail and only a cursory nod to the important navigations of Cook. The northern coastline from Greenland to Alaska is extremely vague with Baffin Bay being entirely enclosed and the northwestern coastland disappearing altogether. Although not specifically named, Cruttwell marks the explorations of Herne along the Coppermine River and his sighting of the Coronation Gulf at roughly 70 degrees north latitude. Cruttwell also notes but does not specifically reference the explorations of McKenzie northward from Great Salve Lake along the McKenzie River and his own important sighting of a great body of fresh water (probably Great Bear Lake) at roughly 70 degrees. Hearn and McKenzie's exploratory work finally ended the popular speculation that a northwest passage might be accessible from the Hudson Bay. Outline color and fine copper plate engraving in the minimalist English style prevalent in the late 18th and early 19th centuries. Mountains and topographical other detail shown by profile. Drawn by G. G. and J. Robinson of Paternoster Row, London, for Clement Cruttwell's 1799 Atlas to Cruttwell's Gazetteer. Very good. Original centerfold. Platemark visible. Some offsetting. Moderate overall toning. Blank on verso. Northern margin cropped through title.